Looks good on my counter. The chromed plastic assembly is the milk frothing device. I like me a nice cappuccino once in a while, but I rarely get one because reasons. So, my wife surprised me with this little gem at Christmas, and I’ve been using it since. 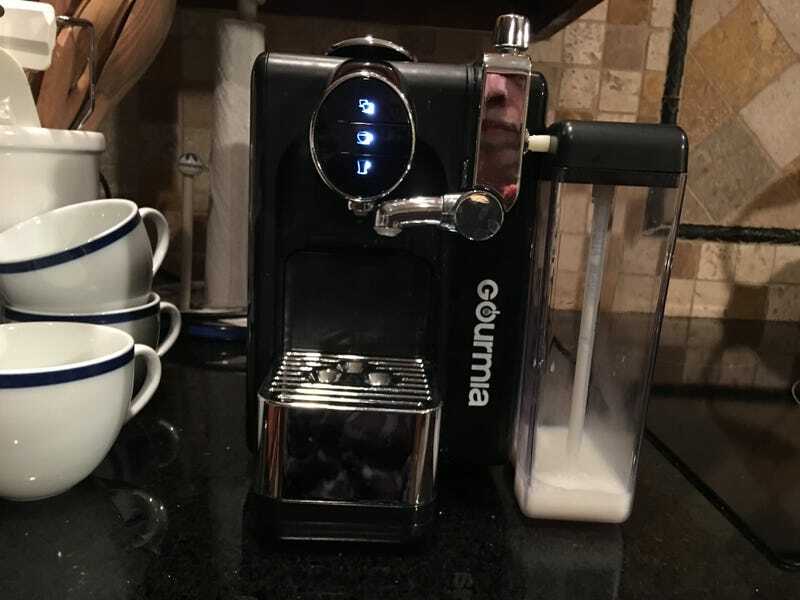 It’s a consumer grade espresso/cappuccino machine that uses the small size Nespresso pods to make your choice of: 1) an espresso (single or double), 2) cappuccino, or 3) latte. You fill the reservoir in back with water, and the milk container on the side, pop in a capsule, and press one of the buttons. It takes a minute to warm up when you turn it on, then it brews your coffee and steams and froths your milk right into the cup. The milk is a neat trick that even my parents’ fancy Saeco machine doesn’t do. The coffee tastes good. I’ve never had Nespresso before, but I’m impressed as compared to most beans I would buy and grind. The milk is nicely steamed, and the froth on top is a good microfoam. Interestingly, when you make a cappuccino, the machine puts in the steamed milk and froth first, and then the coffee, which sinks to the bottom, macchiato style, but when it makes a latte, it reverses the order. My biggest gripe is that it doesn’t warm the milk very much. So, the final cup you get is warm but not hot, and it doesn’t take long for it to cool down. I’d like it to be quite a bit warmer, not so much that I have to wait for it to drink, but enough that it stays warm to the last sip. The second thing, for me anyway, is that it only makes a few millimeters of foam. I think there should be more like a cm on top, but that’s a small gripe considering I get some in every sip. One thing I found out is that I must remove and rinse out the milk apparatus and its incorporated Nalgene tubing after each time I use it or the next cup will not foam. This is not a big deal, since one shouldn’t leave milk sitting in the tubing at room temp for a long time anyway. Still, the assembly is made of plastic, and I’m sure it will be the eventual point of failure with all this handling. I like it. I get to have my coffee every morning and sometimes in the evening, which I never got to do before. It’s usually once a year or so I’ll get one at a coffee shop. So, I’d say it’s worth the $130 it cost. The Nespresso pods aren’t cheap, but I see that there are well-rated copies available in bulk on Amazon that I’ll buy when these run out. It doesn’t have any way to pack a pod with free grounds, so there will be no grinding my own blends, but then who am I kidding? This is for convenience. I may have to get some nice special cups to really feel my Italian roots, though.